Hiring a roofer for your home can be a difficult decision. Most roofing materials will last at a minimum 15 years. So even if your roofing last just the minimum amount hiring a roofing contractor in Howell Michigan is not something that you’ll do often. There are many different roofing contractors that offer services in the Howell Michigan area but they can be very different in terms of quality and price. 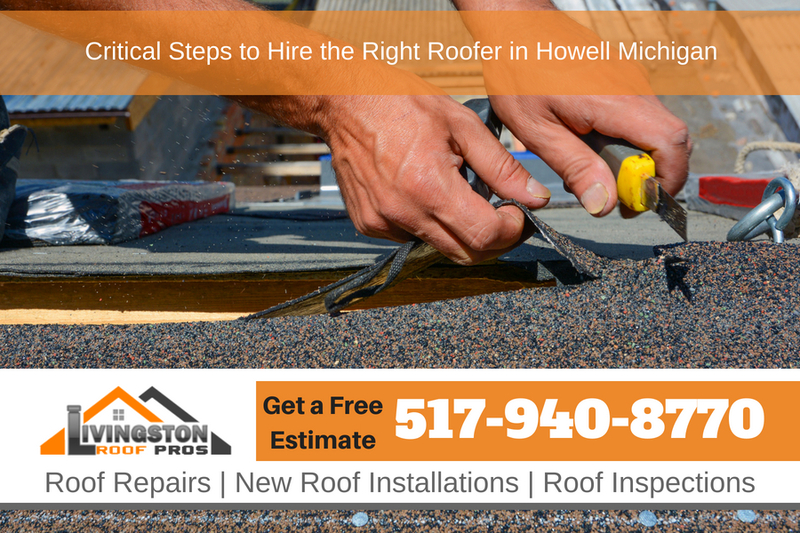 Included in this article is fiver critical steps that you should follow in order to get the best roofer in Howell Michigan for your roof repair or roof replacement project in Howell Michigan. Having a roof that leaks not only causes damage to the roof but it can also damage many other areas of the home including the furnishings of the home as well. So a small roof leak may not seem like much of a problem but when the water comes into your home and damages the walls and ceilings and then goes down and damages your sofa and television, that small roof leak can quickly add up to many dollars in damages. Hiring a fully qualified roofer is key to make sure your roof is installed correctly of make sure the roof repair in Howell Michigan is done correctly can help you avoid this roof leak. Here are some things you should look for when hiring a roofer in Howell Michigan and why Livingston Roof Pros is your best choices for a roofing contractor in Howell Michigan. There are many places online that can help you make a better decision on a home improvement contractor. Some of the most popular are Yelp and Google reviews. Although there may be reviews left, you’ll need to compare these reviews and look at how the company responds to these reviews. Competitors will sometimes leave negative reviews just to get more customers. Be vigilant in your search and you should see a pattern and help use it to make a better choice for a roofing contractor in Howell Michigan. Getting a general estimate over the telephone is a great way to get a better idea of how much your roof will cost but you’ll want to make sure you meet with the roofing contractor at your home. Have the roofing contractor give a firm estimate or quote on installing the new roof. Many times, roofing contractors will change the quote once they get to the home. This ensures you don’t have any surprises when you get the final bill for the roofing project. Some roofing material manufacturers will require the installer for the roofing to be fully licensed and qualified. This can sometimes be a manufacturers qualification as well. Talk with the roofer you plan on hiring and ask them about their qualifications as well as their license and insurance. Sometimes home owners are a bit apprehensive about signing a contract for the roofing that will be installed on their homes. But a contract doesn’t just protect the contractor but it also protects the home owners as well. Make sure all the details are included in the contract and if needed take an extra day or two to look over the contract that should include everything you have discussed with the roofer in Howell Michigan. When getting estimates and quotes for a new roof installation in Howell Michigan you will certainly get some low offers. Remember the age old adage which is “You get what you pay for”. Most contractors that offer very low offers do so and leave out important items or materials in the roofing project which can put your home at risk. Always get clarification and details if you are considering a low offer on a roofing project for your home. At Livingston Roof Pros we would be happy to give you an estimate on a new roof installation in Howell Michigan or just a small roof repair. Give us a call today and speak with one of our experienced roofers in Howell Michigan.